Conveyors are used to transport many different types of materials. 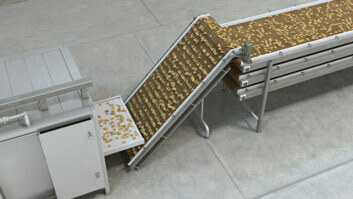 This conveyor uses a rotating, screw-like auger to transport materials. 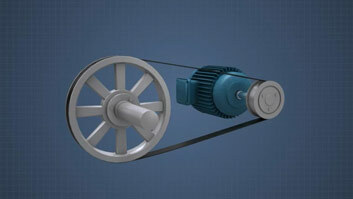 Common conveyor drive types include the chain drive and the V-belt drive. Each has its own advantages. Hundreds of conveyor types are used in manufacturing and industrial environments to move materials from one location to another. 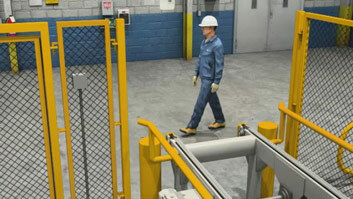 Conveyors can reduce workloads and make production more efficient. 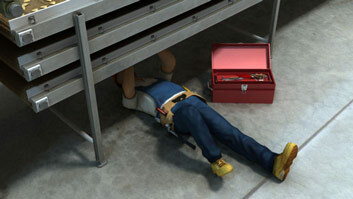 They can also prevent injuries that result from carrying materials manually. 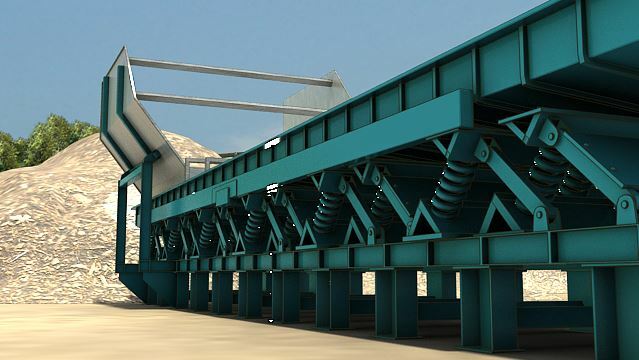 Different material handling systems require different conveyor types to move products or raw materials effectively. This module will discuss common components of conveyors as well as specific conveyor types and their uses. Common conveyor components include the frame, supports, the gearmotor, gear reducers, the take-up assembly, bearings, conveyor merges, drives, and pulleys. Common conveyor drive types include chain drives and V-belt drives. Advantages of chain drives include that they have no slippage, can carry heavy loads, and have a long life span. 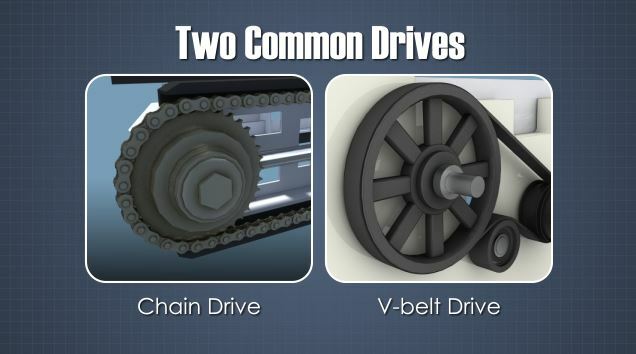 V-belts are designed to wedge into the sheave groove, which increases the force the belts produce in tension and, in turn, reduces the tension required to produce the equivalent torque. Common types of pulleys on conveyors include drive or head pulleys, return idlers, snub pulleys, take-up pulleys, and tail pulleys. Common conveyor types include roller, chute, wheel, belt, chain, slat, bucket, screw, vibrating, pneumatic, sortation, and portable conveyors. 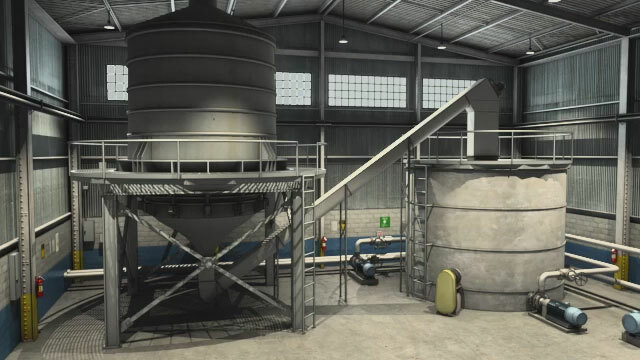 Screw conveyors use rotating screw-like augers to move liquid or granular materials out of a bin or within a tube. The screw is commonly referred to as a "flighting." The flighting is typically set horizontally or with a slight incline. It is typically driven at one end, and can either wrap around a shaft or be shaftless. 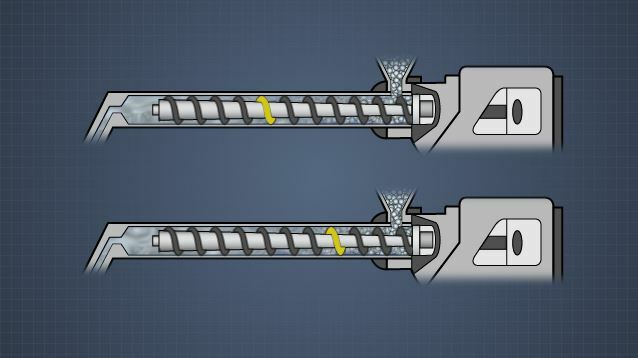 The faster the screw rotates, the faster the material will move from one location to its destination. They are useful in bulk handling industries, such as agriculture, for accumulation, drying, and moving material vertically.